We knew we had a problem. As an enterprise global marketing team of more than 100, we had no clear way to see what each group and individual was working on. Even worse, regions sometimes featured messages that conflicted with our brand direction. Obvious inefficiencies and a general lack of process routinely caused project roadblocks and confusion. We were unable to scale large campaigns across markets quickly. In short, we were disorganized and we were wasting time and money. I became a master of change management. We secured buy-in for technology and onboarded the entire global marketing team to a streamlined project management system for the content, social, PR, digital, and product marketing teams. We moved from siloed groups and markets to a successful global integrated marketing team. And, with these tips, your team can do the same. Outline what roadblocks your teams face. Our global team had a unique challenge – many of us worked in different cities, even different countries, and most worked remotely. We had highly talented people to get the job done. What was stopping us? By identifying and documenting these obstacles, we were able to set the stage for conversations around budget and buy-in for a technology solution to help solve those challenges. 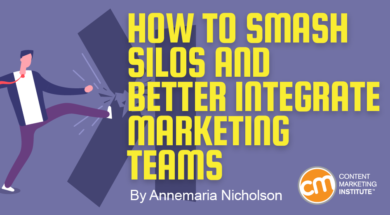 After we identified the obstacles and silos that were preventing us from becoming a truly integrated marketing team, mapping the goals became easier. How could we easily integrate our day-to-day calendars and better complement each other’s efforts? With the roadblocks faced and primary goals outlined, how could we get from A to B? It was time to let my marketing leadership team know I was going to connect with vendors to see if there was a solution worth considering. I also asked leadership about the budget – how much money could be set aside for something we could all benefit from if it meant we could see real efficiencies and measurable outcomes? Having a rough number was useful to share with vendors. First, I vetted several project management platforms. Before each sales call, I would send the salesperson the clearly outlined roadblocks faced by the team and the goals we set to address them. That saved time and gave the salesperson a better idea of what I hoped to see when we discussed their solution. How prepared were the salespeople? Did they address solutions for my unique situation or just run through a generic sales deck? If the solution didn’t check every single box, how agile was the organization? Could it come up with a short-term solution to meet my needs? Did it have a mechanism for the front-line team to relay feedback to the product team to get an improvement slated onto the product road map? How hands-on would the onboarding process be? Was I going to be given a log-in and be on my own? Or was a team from the vendor going to help with tech adoption and change management, and see that every person in my group felt like they were part of this? What kind of integration capabilities were offered? Did the product have an open API? Was the team skilled at connecting different technologies and plugging it into my organization’s martech stack? When scheduling each call, I included 30 more minutes on my calendar for reviewing my notes and screenshots and analysis of the platform, including pros and cons, and potential competitive advantages of one system over the other. Most project management solutions offered met most of what I wanted. In the end, the choice came down to which salesperson was most prepared and engaged, which organization was going to be more agile in finding solutions to my problems, and how strong the customer success team was. Ultimately, there was a clear winner. Now, it was time to go back to the marketing leadership team with the recommended solution. Bringing a new piece of technology to our team was a big request. To prepare, I went back to my vendor notes and built a slide deck to share with my marketing leadership. I created two slide decks. The first was an expansive version weighing the pros and cons of each system and my ultimate conclusions. The second deck was just a few slides on the technology I wanted to purchase, how much it would cost, and what it would mean for our team and each stakeholder. To prep for my presentation and overcome objections internally, I put myself in the shoes of the marketing leaders. What would be their main concerns about incorporating a project management solution into our workflow? Was budget an issue? What about the development work required for integrations? Would there be concerns on how specific processes would translate into the new formal system? I incorporated the responses into the slide deck’s notes feature so I would be ready with answers. My pitch for the recommended solution met with approval from the leadership. I became the team lead for its implementation. Now it was time for the fun to begin. We rolled up our sleeves and got to work, spending the next few weeks working with our immediate teams and documenting workflows. For some, this was an easy step because an established and transparent process with stakeholders and approvers already existed. In other instances, workflows were unpredictable because they needed to be highly customizable each time. The Tiger Team then mapped each task, each workflow, and each stakeholder on a worksheet. Then we worked with our tech onboarding team to move these workflows from paper into the integrated marketing project software. We were lucky – they did most of this implementation work. However, there were times when we wanted to customize things ourselves, and I valued that the software gave us the autonomy and ability to do just that. Once the workflows were incorporated into the system, Tiger Team members tested each one. Did it work as expected? Did they like how the process worked in reality? Were there any holdups? We worked through the problems one by one and were quickly able to iron out the wrinkles to everyone’s satisfaction. Now that the integrated marketing ecosystem was built, we were ready to roll it out to the broader marketing team. Leadership did a great job of communicating the project to the larger group and Tiger Team members fielded questions. The goal was to make sure that each person felt comfortable in the system and had the proper training to get started. We partnered with the vendor to lead individual training sessions for each group so that they could learn their specific workflows. They were given access to the system and we asked them to try it. We also shared recordings of training sessions so they could go back and refresh their knowledge as needed. One-on-one sessions for people slow to adopt the technology also were held. We scoped three months for the project. At the end, we felt like we had won a marathon. Most of the team was using the project management system for their day-to-day tasks, and projects were being scaled across groups and markets more efficiently. With everyone looking at the same calendar, campaign planning and resource allocation improved. We also were better able to plan around big events. For example, if one of our executives was speaking at a conference, we could turn up the social promotion for the conference and perhaps hold off on other campaigns that could dilute the impact of that event. Tracking success is a big part of every marketing organization’s goals, and no one solution is right or wrong. But, for me, it was a great victory to be able to better track conversions, lead metrics, visitors to our site, revenue, and more. By bringing everyone together into one ecosystem, we were able to showcase and share successes and prove the value of our impact on the business. In the end, the department felt more comfortable working cross-functionally, resulting in a less siloed workflow. We better recognized each other’s successes and helped one another when needed. That was how we became the better global integrated marketing team, which felt like a victory for all. Want to learn more about choosing and implementing technology to support your content initiatives? Register to attend ContentTECH this April in San Diego. Use code BLOG100 to save $100. I drive integrated marketing strategy for brands as director of customer success at NewsCred. By bringing together people and systems, I help scale enterprise marketing programs globally and optimize efficiencies to drive brand awareness, leads, and revenue for businesses. Prior to NewsCred, I was with Cision for ten years as director of content, social media and community. Connect with me on Twitter or on LinkedIn.